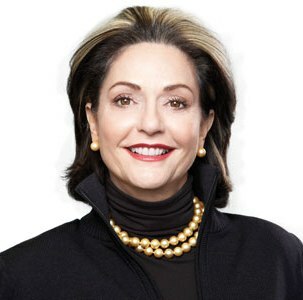 Colorescience founder, Diane Ranger, also founder of Bare Escentuals in 1976, invented mineral makeup in 1977. Later she proceeded to create powder sunscreen in 2004. Colorescience Pro is the 21st Century version of mineral cosmetics stressing that each ingredient in each formula has skin care benefits. Every product is formulated to offer sun care and sun protection. Only the highest quality ingredients are used and products are formulated in high percentages with research to support efficacy. People often question if makeup can really offer sun protection. What provides the sun protection in Colorescience makeup? Micronized Titanium Dioxide and Zinc Oxide. These are physical sunscreens that work on the surface of the skin to refract and reflect the light away from the skin. Traditional sunscreens work by turning light energy into heat energy, which is why most sunscreens make the skin feel hot and sticky. Colorescience Pro Sunforgettable Mineral Sunscreen, Foundations and Primers all offer sun protection that is easy, elegant and effective. Colorescience Pro has the Skin Cancer Seal of approval. Stringent testing is required to receive this seal. What makes Colorescience different than other makeup brands on the market with SPF? Colorescience Pro uses only physical sunscreens and never uses chemical sunscreens. Chemical sunscreens absorb into the body and generate heat. This exacerbates skin conditions like rosacea, pigmentation or acne. Colorescience Pro uses Zinc Oxide, which is a category one diaper rash treatment, to calm the skin conditions. Titanium dioxide is excited by light and creates an anti-microbial on the surface of the skin. Both of these ingredients will calm the skin and give great sun protection on the surface of the skin! What skin types does Colorescience makeup work well on? All skin types, ages and genders. How do you apply the powder for best results? We are very proud of our self dispensing brush because it makes reapplication so easy. You don’t even need a mirror to reapply throughout the day. We like to say that we have taken the mess out of minerals. It is important to cover the skin surface thoroughly (it still looks and feels weightless), and then continue to reapply and add to the protection as the day unfolds. The minerals are stable and will not break down on the skin the way chemical sunscreens do. How do you apply the “setting mist” before or after the powder? Is the “setting mist” necessary? Just spitz the setting mist after each application or any time you want to “give your skin a drink”. As we should drink eight glasses of water for our body each day, our skin loves to be hydrated as well. The mist adds a boost to the mineral product, making the minerals even more transfer resistant. The mineral sunscreen work very well independent of the setting mist. The setting mist is a bonus to add an even more beautiful glow to the skin. Is Colorescience makeup water resistant? Colorescience Pro Sunscreen products are rated “Very Water Resistant”. This is the highest rating awarded to sunscreens. To see just how effective the minerals are, you can go to Colorescience.com and see the “Water Test”. It is a truly amazing demonstration. How often does it need to be applied to provide sun protection? The FDA requires reapplication of all sunscreen products every 90 minutes. There are many different factors each person should take into consideration when spending time in the sun. What is your skin type on the Fitzpatrick scale? Are you in high or low altitudes? Are you in the water or on the snow? Are you on medication? What time of day will you be in the sun? Understanding and respecting the sun are important to optimum health as the sun can be a wonderful thing if we are responsible. 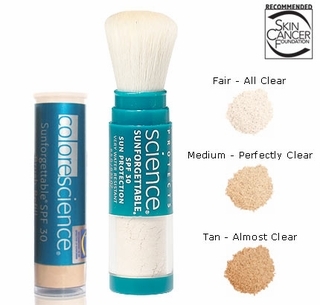 Want to learn more about Colorescience Pro products or shop for their SPF mineral makeup? Visit coolibar.com/colorescience. Summer is the perfect time for the pool, playgrounds and sun-filled activities. Fortunately, with good sun habits, children can enjoy sunny days outside without risking their health. Just one blistering sunburn in childhood more than doubles your chances of developing melanoma later in life. And unfortunately, 54 percent of children burn or tan in their second summer, and 22 percent burn in their first, according to the Skin Cancer Foundation. 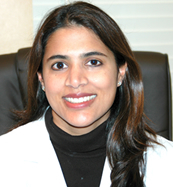 Board certified Pediatric Dermatologist Dr. Manju George specializes in personalized care for infants, children and young adults. She understands that kids have unique dermatologic requirement because “children are not just small adults.” Dr. George offers advice on how to keep your kiddies protected from the sun’s rays by knowing what to look for in sunscreen, how to use it, and how to add fun to habits so that your kids will enjoy sunscreen time. 1. LOOK AT THE LABEL. A lot of parents assume, well, the higher the SPF, it must be better. What you really want to look for is the ingredients in your sunscreen. What I recommend is zinc oxide or titanium dioxide [These are physical sunscreen ingredients.] Choose an SPF of 30 that’s labeled broad spectrum. That means it protects against both UVA and UVB rays. 2. AVOID SPRAY ON SUNSCREENS. The major drawback of an aerosol sunscreen is that it could get into the eyes or inhaled by a child, and we really don’t have the long-term data on those effects. 3. USE GENEROUS AMOUNTS ALMOST EVERYWHERE. One of the biggest mistakes parents make is number one: not applying enough sunscreen. Apply sunscreen 30 minutes before leaving the house, no matter what the weather. Even on a cloudy day, you still get 80 percent UV exposure. Start with the neck down, make sure you cover thick and evenly on all areas of the body, not forgetting the ears, backs of the hands, crease of the neck, underarms, between the fingers, underneath the bathing suit. After you’ve covered those major areas, you should do the face last. 4. REMEMBER THE LIPS AND SCALP. The lips need protection as well. Another tip that I give parents is to put it in his or her part line. But one of the best ways to protect scalps is to actually purchase a hat. 5. MAKE APPLYING SUNSCREEN FUN! I like to call it your magic cream or magic lotion. Children like making it special. Don’t make it a chore. One mom actually told me she uses a paintbrush and has the child paint the sunscreen on themselves. Another thing that children really like to do, is they like to apply it on you, so let them apply it on Mom or Dad. They tend to be much more receptive when you do things together and you make it a fun activity for them. Parents, it’s up to you to keep your little ones protected from the sun, so keep Dr. George’s advice in mind during outdoor playtime. To best protect your child from the sun, cover them with a hat, pants and long sleeve shirt, apply sunscreen every two hours or after sweating or swimming and limit time outside when the sun is strongest (between 10 a.m. and 4 p.m.). Have fun making fun with sunscreen! Coolibar asked sunscreen expert Kirk Minster from Fallene, Ltd., the maker of Total Block and Cotz Sunblock products, to host a Q & A session on the Coolibar Facebook page. With over six years of experience at Fallene, Kirk had plenty of valuable sunscreen information to pass on. Here is a brief recap of the session. I have had skin cancer surgery on my nose and have been trying hard to use sunscreen every day. One problem that I have is taking sunscreen wherever I go, to reapply every two hours. I would love to have an option of single application containers (or towels, if that could be possible) that I could pop in my pocket or purse and not have to worry about it leaking and getting on everything. Does anything like this exist? Convenience is always an issue with sunscreen, but unfortunately, anything that is either a spray or a moist towel is going to have chemical sunscreen filters only, no titanium dioxide and zinc oxide, the two ingredients that will give you the best broad spectrum photo stable protection. That said, for your nose I would use LipCotz SPF 45. This is in a small portable tube that will fit in your purse or your pocket. It is not only great for your lips, but it can be applied to your nose and ears as well. Finally, all of the Cotz products are in tubes with secure twist tops so the risk of any opening and ruining a purse is next to zero. How do your products rate on the skin deep cosmetic safety data base? All of the ingredients are FDA approved and have been in use for decades. As the Cotz line has evolved, we have taken great pains to limit the number of ingredients while providing products that give the best broad spectrum ( both UVA and UVB light) best photo-stable (this means the product does not break down when exposed to sun light, a common problem with chemical sunscreen filters) possible. Fallene’s products are not safe because I am telling you they are, though I am giving you this assurance. They are safe because years of study into the active and inactive ingredients by competent, well respected scientists have determined they are safe for use on the skin. I think you will find the TGA report compelling. With hope the FDA will release a monograph for the UVA spectrum of light in 2011 so that consumers will have some way to gage the effectiveness of their sunscreen against the deeper penetrating UVA light. Most sunscreen burns my face, so I have to use fragrance free sensitive skin types on my arms & chest but cannot find a brand that does not burn sensitive facial skin. Any tips? Try the Cotz SPF 35 Zinc only, we made it for you and all those with very sensitive skin. Also, the Face Cotz SPF 40 is great for sensitive skin and is very silky to the touch, so it will feel light and smooth on the surface of your face. For the active ingredients, you have a sunscreen with both Zinc Oxide and Titanium Dioxide, and then one with just Zinc Oxide. Why is this? Part of the answer reflects Fallene’s evolution as a sunscreen company, part of the reason resides in the intended function. Total Block 65 and Total Block 60 are older products. Total Block 60 is a makeup cover-up. 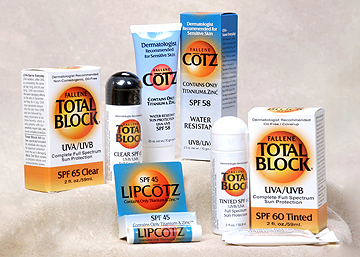 Total Block 65 is a sunscreen that is designed to be non-comedogenic. Non-comedogenic simply means it will not cause the user to break out with blemishes. Over a decade ago when both TB 60 and TB 65 were formulated, the best way to get a non-comedogenic sunscreen with superior protection and a focus on high SPF was to use both chemical and physical actives. As Fallene, Ltd. evolved, more recent product, in particular the Cotz SPF 35 20% zinc reflects a less is more approach. With only 20% zinc as an active, it exposes the user to as few potentially irritating ingredients as possible, still gives adequate protection from UVB with an SPF 35 (Experts suggest SPF 30 is enough, anything more is probably more than you need) plus great protection from UVA as well. Is there a way to reduce the white residue some zinc based sunscreens leave behind? It can be especially bad when I’m running outside and I start to sweat. I suggest the FaceCotz SPF 45 for you in combination with the Cotz SPF 35 20% zinc. Use the Face Cotz on your face as you might have guessed and the Cotz 20% zinc everywhere you have exposed skin. You will find both free of that white residue and both are water resistant. The FaceCotz is very water resistant so will give excellent sweat resistant protection for your face. Are your products safe to use on babies/toddlers? For children 6 months and older, I recommend the Cotz products. In particular, the Cotz 20% Zinc only. Do your sunscreens contain nano-particles? If so, is this a concern? The titanium and zinc in our products is technically micronized. I know much has been made of nano particle/ nano technology in the past few years. This year, for the first time, the subject was researched by dermatologists so that they could make recommendations to other dermatologists. What this report said is what numerous previous studies concluded, micronized titanium and zinc are safe for use in functional cosmetics. The Environmental Working Group is a good source of information on this topic. Chemical sunscreen absorbers by definition absorb into the skin. Physical protection, titanium and zinc, rest on the surface of the skin. Studies by the European Union, the FDA, and the Australian Regulatory agency called the TGA, all show that micronized titanium and zinc will not absorb through the outer layers of skin, into deeper layers of skin. This is an excerpt from the TGA website; the TGA is the Australian equivalent of our FDA and has rigorously studied nano particles in sunscreen. Here is what they have to say: In early 2009, the Therapeutic Goods Administration (TGA) conducted an updated review of the scientific literature in relation to the use of nanoparticulate zinc oxide and titanium dioxide in sunscreens (see below). -To date, the current weight of evidence suggests that titanium dioxide and zinc oxide nanoparticles do not reach viable skin cells; rather, they remain on the surface of the skin and in the outer layer of the skin that is composed of non-viable cells. For the full TGA report on the safety of Titanium and Zinc, please use this link: http://www.tga.gov.au/safety/alerts-medicine-sunscreens-051202.htm#nano. The report confirms that all research thus far shows these ingredients to be safe and the best protection from the sun. The Therapeutic Goods Administration is well respected. They have paid such close attention to this topic because Australia is the perennial front runner in cases of skin cancer per capita. They want to know what works to help prevent skin cancer but are also concerned with safety. The link above will take you to the full report on nano particle titanium and zinc that can be downloaded as a PDF. Why is there tint in some of your sunscreen? I found this out after purchasing and using it in Hawaii. The tint is the iron oxide that we use in Cotz SPF 58. Iron Oxide is as common ingredient in makeup that has been used as a color agent for decades. In Cotz SPF58, the Iron Oxide acts to offset the whitening effect of the Titanium and Zinc. Although it is not an FDA approved active sunscreen ingredient, studies show that the small iron particles also act as good protection high up in the UVA range of light, near the visible light range. Cotz 20% Zinc SPF 35 which has no tint. What are the most effective sunscreen components/things to look for in a sunscreen? Look for two key ingredients, titanium dioxide and zinc oxide. These FDA recognized active sunscreen ingredients are the best broad spectrum and photo-stable (will not break down when exposed to light) so will provide the best protection. 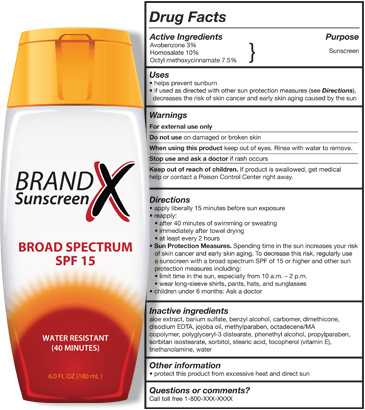 Do your products use chemical sunscreen filters or only physical? The entire Cotz line with four different products in all is physical protection only, no chemical sunscreens. The older Total Block products, around for more than a decade now, combine chemical and physical FDA approved active sunscreen ingredients. What is the difference between your Cotz brand and Total Block brand? Cotz is chemical sunscreen filter free using just titanium dioxide, and or zinc oxide for sun protection. The Total Block products combine physical block, titanium dioxide and zinc oxide with chemical sunscreen filters. Shop for Cotz and Total Block sunscreens at Coolibar. Remember full sun protection includes a sun hat, UV clothing, sunglasses and broad-spectrum sunscreen. Don’t Fry Day, the Friday before Memorial Day Weekend, is the perfect day to pack up your sunscreen, hats, sunglasses and sun protection clothes so you’ll be prepared for a sunny holiday weekend. So how do you choose the best sunscreens and sun protection options for you and your family? 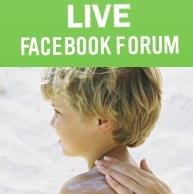 Join Coolibar for a special Facebook event on Thursday, May 19, 2011 that will help kick-off your summer sun protection plan. Starting at 1:30pm CST (11:30am PST, 2:30pm EST) on the Coolibar Facebook Wall, we’ll have Sunscreen Expert Kirk Minster from Fallene, the producer of Cotz and Total Block Sunscreen, available to help you make conscious decisions about the sun protection you use. All sunscreen and sun protection questions are welcome! If you’re on Facebook, go to the event page and click the “Attending” Button at the top to RSVP today! We’ll give a Coolibar UPF 50+ Hat to one person from our Attending List the day of the event. Ask your own questions during the live Q & A session and you could also win sunscreen! We hope to see you there (if even for a few minutes)! Fallene, Ltd. produces the most complete full spectrum sun protection available. These products are used not only by medically photo-sensitive individuals, but by those who are concerned about maintaining their skin’s healthy appearance and promoting the integrity of their immune system. If you have sensitive skin, you’re probably particularly careful about the products you put on your skin, including sunscreen. Since sunscreen is a necessity whenever under the sun, it’s important to find a reliable one that works well with your skin type. Vanicream skin care, formulated by Pharmaceutical Specialties, Inc. (PSI) in Minnesota, is a special skin care line created for those with extremely sensitive skin. 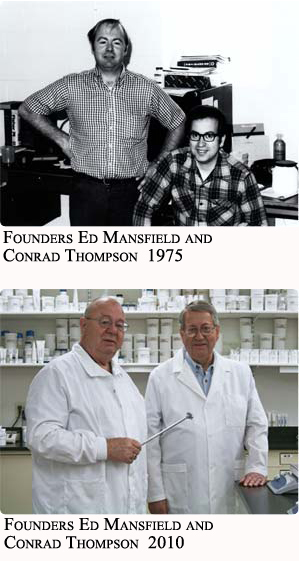 When Conrad Thompson and Ed Mansfield, the founders of the company, were working as pharmacists at the Mayo Clinic in the early 70s, several dermatologists suggested they start a company that could provide over-the-counter skin care for people with sensitive skin. 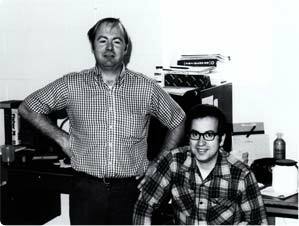 Thus in 1975, PSI (and Vanicream) were created! Since the beginning, their company has formed a line of products that avoid chemicals that dermatologists considered undesirable and sensitizing to the skin, such as fragrance, masking fragrance, dyes, lanolin, parabens, formaldehyde and formaldehyde releasing preservatives. Now you know why Vanicream is one (of several) of Coolibar’s favorite sunscreen providers! Commonly asked questions about Vanicream and Sunscreen answered by sunscreen expert, Brian Leary, Director of Marketing at PSI (Vanicream). What skin types does Vanicream work best on? Vanicream Sunscreens are suitable for any skin type, but they are specially formulated for sensitive skin. What’s a good sunscreen for sensitive skin or acne prone skin? All of the Vanicream Sunscreens are good for sensitive skin. They are developed with an emphasis on physical sunscreen ingredients such as zinc oxide and titanium dioxide. 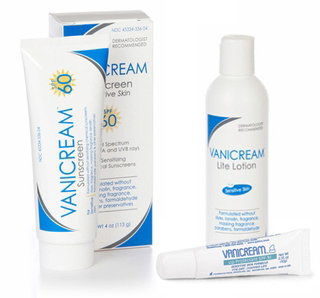 The Vanicream Sunscreen SPF 35 Sport is oil free making it ideal for acne prone skin. How does Vanicream sunscreen hold up in water or against sweat? We recommend the Vanicream Sunscreen Sport SPF 35 for outdoor activities such as swimming and running. What should you look for in a safe sunscreen? You want to look for sunscreens that emphasize the physical blockers, but you also want to pay attention to the inactive ingredients. If you have sensitive skin, you may want to avoid fragrances, or certain preservatives such as parabens or formaldehyde releasers. What is the difference between a physical sunscreen and a chemical sunscreen? Is Vanicream Sunscreen physical or chemical? Physical sunscreens such as zinc oxide and titanium dioxide sit on the skin and reflect UV rays. Chemical sunscreens absorb the UV rays. Both offer protection. Vanicream Sunscreen SPF 30, SPF 60 and SPF 30 Lip Protectant contain only zinc and/or titanium making them physical sunscreens. Vanicream Sunscreen SPF 35 Sport contains zinc oxide and octinoxate, so it is a combination physical/chemical sunscreen. What is a safe age to start using sunscreen on children? Is Vanicream safe for babies and young children? 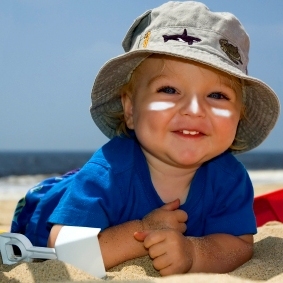 FDA does not recommend sunscreen use on infants under 6 months of age. Vanicream Sunscreens are very safe for children older than 6 months. How do SPF ratings work? An SPF rating is the ratio of the time of ultraviolet radiation exposure necessary to produce minimally detectable erythema (sunburn) in sunscreen protected skin to that time required to produce erythema in unprotected skin. So if your skin would burn in 5 minutes without sunscreen, an SPF 15 sunscreen should give you 15 times that protection or 75 minutes. What is the best SPF to give you proper sun protection? An SPF 30 will block about 96% of the suns UVB rays. But this is only if you apply enough to the skin. For this reason, some dermatologists will recommend higher SPF sunscreens, knowing that their patients may not apply enough. It is important to remember that SPF only applies to protection for UVB rays. For proper sun protection you need to choose sunscreens that protect from both UVB and UVA rays. What is the difference between UVA and UVB rays? Does Vanicream block both? UVB rays are the shorter rays that can cause sunburn. UVA rays are longer rays and are thought to penetrate deeper into the skin and cause premature aging and possible skin cancer. All Vanicream Sunscreens protect from both UVB and UVA rays. Does Vanicream leave behind a white residue like some sunscreens do? You may notice a little white residue upon application, but this disappears quickly on most skin tones. What about the issue of nano particles in physical sunscreens. Should we be concerned? Does Vanicream contain nano particles? While Vanicream Sunscreens contain micronized zinc oxide and titanium dioxide, the particles are not considered nano. That being said, the most recent studies on this issue have found that nano sized zinc and titanium do not penetrate the skin’s layers and therefore do not get into the bloodstream. With so many products on the market it’s hard to choose. What is the differentiating factor for Vanicream products, both sunscreens and moisturizers? Vanicream Sunscreens are going to provide UVB/UVA protection and not expose the user to unnecessary irritants that could be problematic for people with sensitive skin. They are non-comedogenic and safe to use every day. 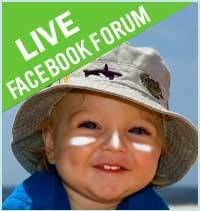 Once again, we can thank our Coolibar Facebook fans for another successful sunscreen forum. If you missed out on the action, here is a short recap of our session with sunscreen/skin care expert Natalja Millsap from Sweetsation Therapy. Q. Does your baby lip balm have SPF protection? Is it safe for babies to eat this stuff? A. There is no SPF protection because we believe that the balm gets eaten faster than it would last for sun protection. But it does contain natural sun protection in a form of Shea butter. It’s about 4%…Other natural oils also add sun protection, like raspberry SPF4, hemp SPF6, grape seed SPF4 and avocado SPF4. Q. What if I sweat a lot in the summer? How do your products hold up against water/perspiration? A. They hold up pretty well, however some of it comes off with the sweat. So re-application is essential. Q. Can your sunscreen be used on extremely sensitive skin? We are always looking for sunscreens that work and won’t cause a rash. A. Yes it can! … Titanium Dioxide is the best UV blocker if you have very sensitive skin. Q. What area of the body do people usually forget to cover with sunscreen? What area is the most sensitive to sun? A. I would say areas with the thinnest skin. Top of your feet, hands, neck. So you have to pay attention to those too. Q. What about my baby…putting sunscreen on his hands when he is always putting his hands in his mouth? A. That’s something that comes with the territory. They always do that. At least make sure sunscreen is applied on the back of his/her hands because that’s the area that is exposed to the sun the most. Q. What ingredients are safe in sunscreens? A. ZnO and TiO2 are definitely safe. Q. Are there any particular ingredients I should avoid in sunscreens? A. With mineral sunscreens, you are safe. But I would avoid parabens, artificial fragrances that may appear among “other” ingredients in a product. As for chemical sunscreens – oxybenzone is the one I definitely would stay away [from]. It’s very common in commercial sunscreens. Q. What is the difference between “organic” and “natural” sunscreens, if there is one? A. Organic products contain at least 70% of organic ingredients by volume. Natural [products] don’t have to. Q. So is the organic distinction just for marketing purposes, or are organic products generally safer or less abrasive for some skins? A. Feel-wise, there wouldn’t be any difference, but they’re considered to be the “cleaner” choice without contamination of pesticides. Q. What is the best way to store sunscreen so it will last the longest? A. The best place is at room temperature out of direct sunlight. It is not necessary to refrigerate it. Standard shelf life is 2 years; however our sunscreens can last longer because they are packaged in air tight containers that not only prevent bacterial contamination but also curious children hands. Q. Is it really necessary/is there any benefit to wearing sunscreen under clothing? How about under UPF 50+ rated clothing? A. No, there is no real need to wear sunscreen under clothing that offers sun protection. A. From Coolibar – It’s not necessary to wear sunscreen under UPF 50+ clothing; however, you may want to wear sunscreen under regular summer clothing as some summer T-shirts have very little sun protection. If you’re wearing Coolibar UPF 50+ clothing, you only need to cover exposed areas. Q. How much sun protection do tinted car windows provide? A. Yes, indeed, it’s better to reapply as directed (every 2 hours) than not reapply at all. Even if you are already out. There are no drawbacks to reapplying too often. Sunscreen is there to protect your skin. Q. Why is it recommended to wait the 15-30 minutes after application before exposure? A. That’s what the American Academy of Dermatology recommends to give it ample time to absorb. Q. I spend a few hours every day in the sun, always wearing (cheap OTC / drugstore) sunscreen SPF 100+ and sometimes (whenever it’ll be a longer exposure (wearing SPF/UPF shirts/jackets. My skin is still coloring, the slightest bit. Ought I to be concerned? What a high-rated SPF Sweetsation sunscreen can I expect no evidence of sun exposure even when I’m out in it every day? Or is ultimate sun protection impossible or unnecessary? A. Our highest SPF is SPF 50. Percentage wise, it is not a big difference between SPF30 or 50 or even 100. But I am not aware of any sunscreen that would provide 100% of protection. SPF 30 covers 97% of UV while SPF 50 covers 98%. I think it’s all about the application … making sure that you apply a sufficient amount and making sure that all areas exposed to the sun are properly covered. Q. Is it really important to use a different sunscreen on your face than your body? Why? If you have more questions regarding Sweetsation Therapy or sunscreen in general, let us know by posting a question on Facebook or writing a comment below. To purchase Sweetsation Therapy Sunscreen from Coolibar, visit www.coolibar.com/sunscreen.html. Ever wonder what moms-to-be and mothers with small children should look for in a sunscreen or skin products in general? 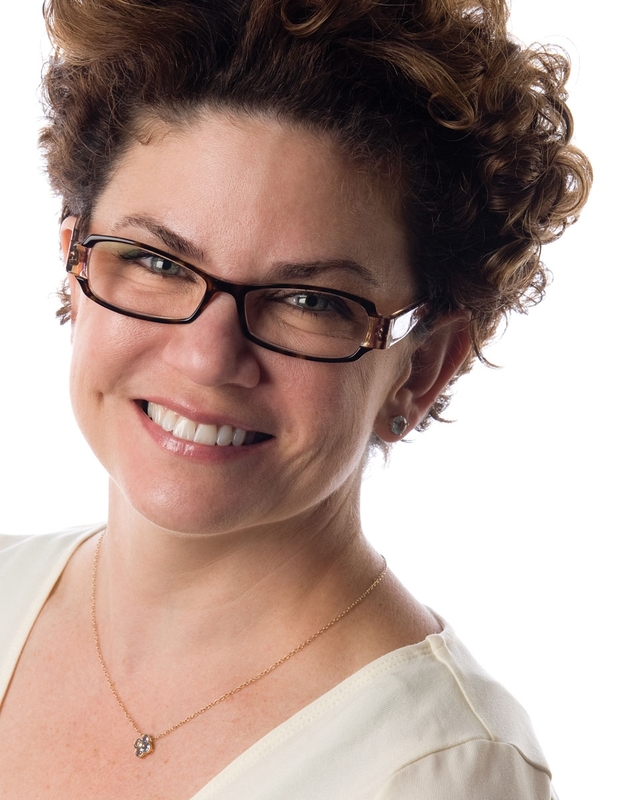 Starting at 1:30pm CST (11:30am PST, 2:30pm EST) on our Facebook page wall, we’ll have expert Natalja Millsap from Sweetsation Therapy with us. RSVP Yes today! Join in the conversation with your own questions and you could win a Sweetsation Therapy Gift Set. Plus there will be an exclusive discount on Sweetsation Therapy products sold on Coolibar.com. We hope to see you there (if even for a few minutes). Being way over 30 and just entering motherhood I was concerned with aging and other skin issues associated with pregnancy, just like any other woman. So one day, I lathered my usual age preventing night cream on my face before going to bed. At that point I believe I was 3 months along. It was one of those high end, smell good creams that promise to do all the miracles in the world to your face…… Next morning I received an email that notifies me every week what to look for and what to expect as your pregnancy progresses. It was in that fateful email I found out about all the harmful ingredients that are present in skin care products and should not be used during pregnancy and may harm the fetus inside you; to the point of deformities and brain damage. In a state of panic I rushed to the bathroom and frantically started reading all the labels on all my “pregnancy” creams and lotions that I was religiously putting on myself daily. Needless to say but all of them contained a “no-no” ingredient(s) that I just read about. Including a major ‘no-no’ like Retinol and Fragrances, aka phthalates. Working in the cosmetic industry for 20 years, for a few major brands, I couldn’t figure out WHY in the world it never crossed my mind before. At that point I thought, “Oh my God, I’ve harmed my baby……”. I suppose, I don’t have to mention that a state of panic was following me everywhere till the end of my pregnancy. That very morning I decided to put all my knowledge and experience to work and create my own skin care company that would design and manufacture everything a woman would need, whether pregnant or not, to take care of her skin, being 20+ or 30+ or even 40+, applied using a daily regimen, and therefore protecting her health and well-being. Sweetsation Therapy products are Organic and natural treatments that look great, feel great and smell great, and therefore make you feel good. We’ve combined the best gifts of earth and ocean in our skin care. Aromatherapy elements nourish your body and soul. And most importantly our products are safe for mom and baby, and everyone who seeks the healthiest alternatives for every day skin challenges. Compare sunscreen and sun protective clothing side-by-side and then determine how to best protect yourself and your family from the sun. Sunscreen protects skin by absorbing and/or reflecting UV rays. The Food and Drug Administration (FDA) requires that all sunscreens contain a Sun Protection Factor (SPF) label. The SPF discloses the amount of sunburn protection that a sunscreen can provide an average user when used correctly. The American Academy of Dermatology (AAD) recommends sunscreens with an SPF of 30 or higher. Although the SPF ratings found on sunscreen packages apply to UVB rays, many sunscreen manufacturers include ingredients that protect the skin from some UVA rays as well. These sunscreens are usually labeled as “broad-spectrum” and are recommended since both UVA and UVB have been linked to skin cancer according to the Environmental Protection Agency. Sun protective clothing uses fabric to protect skin from the sun. The fabric is rated according to an Ultraviolet Protection Factor (UPF). UPF is like SPF except UPF rates protection against both UVA and UVB. A garment with a UPF of 50 only allows 1/50th of the UV radiation falling on the surface of the garment to pass through it. In other words, it blocks 49/50ths or 98% of the UV radiation. Sun protection clothing is an easy and reliable form of UV protection and so is becoming more and more popular. Look for garments that have been tested according to American Association of Textile Chemists and Colorists (AATCC) Test Method 183. The best brands also perform complete life cycle tests using American Society for Testing and Materials (ASTM) D 6544. This form of testing tells how garments protect as they age not just when they are brand new. The AAD says for sunscreen to be effective in protecting skin from UV rays, it should be applied to dry skin 15 to 30 minutes before sun exposure. Apply it to all exposed areas and pay particular attention to the face, ears, hands, and arms. One ounce, enough to fill a shot glass, is the amount needed to cover the exposed areas of the body properly. Sunscreens should be reapplied approximately every two hours or after swimming or perspiring heavily. Coolibar Sun Protective Clothing provides intant coverage. There is no need to reapply anything, except broad-spectrum sunscreen to areas not covered by the clothing. Coolibar’s sun protection never fades or washes out as titanium dioxide or zinc oxide blockers are permanently embedded in many of our material’s fibers. Other items, such as our UV swimwear and hats, are formed with a tightly woven material that offers UPF 50+ protection. Coolibar carefully tests each garment to ensure excellent sun protection. By using both sun protective clothing and sunscreen you can achieve ultimate protection! Wear sun protective clothing to cover majority of skin and choose a broad-spectrum sunscreen (which blocks UVA and UVB rays) with an SPF of 30 or higher to cover all skin exposed to sunlight. Wear a sun protective hat with a 3” brim or greater to shade your face, ears and neck. Then slide on some sunglasses that block 100% of UV rays or offer UV 400 protection to cover your eyes. Be sunAWARE and be safe. I wanted to talk to you about How to Choose a Sunscreen. It can be overwhelming. You walk into a store and you see hundreds of items on the shelves, but how do you even begin to choose. Number one, the number you look for tells you how long that sunscreen is going to work. So if you’ve got a 30 it will work twice as long as a 15. Use SPF 30 or higher. You also need to be mindful of what the ingredients are. There are two main groups. Sits on the surface of your skin and creates a physical barrier to UV rays that blocks/reflects them away from the skin. – Works right away on both UVA & UVB rays, no need to apply 20 minutes prior to sun exposure. Creates a chemical reaction within the skin that allows the sunscreen to absorb UV before it penetrates the skin. – Apply 20 minutes before sun exposure. – Ingredients: octyl methoxycinnamate (OMC), homosalate, and octocrylene absorb UVB, while oxybenzone, avobenzone and ecamsule absorb UVA. These two categories are for two different types of skin. Sensitive skin likes the physical sunscreen – great choices – Vanicream 60, super compatible with sensitive skin. Physical Sun Blocker – Not going to be as likely to sting as the sunscreens that have some chemical sunscreen ingredients. But, the chemical sunscreen ingredients last longer, they soak in, they’re better for sports and water resistance. So, look for a good high SPF number, 30 or higher and then maybe a combination of chemical and physical if you’re not really sure which one is right for you. If you’re sensitive, stick to physical. If you’re really going to be working out, get the chemical ones. That at lease gives you a starting point. Brand wise, if you like organic, Soleo is an Australian brand – all physical so that should be compatible with most people’s skin. We talked about Vanicream. Don’t forget your lips – Fallene LipCotz. Physical sunscreen for the lips, especially men, is super important. That lower lip we often see skin cancer. Women wear lip products more, lip balms and lipsticks so we tend to have more natural sun protection, men do not. Blue Lizard, the fun thing is that the color changes when Ultraviolet light hits it so you know you need it when the bottle is blue. It’s a mixture of chemical and physical. That gives you a starting point. Don’t forget 1 ounce is what you need, 2 tablespoons or basically a shot glass full. Way more than you think you need. You’ve got to get a nice even coating and re-apply every couple of hours, especially in the heat of the day, especially if you’re sweating. So Don’t Forget to Be SunAWARE!